Sometimes you just don't feel like going to church. We've likely all been there. Maybe you have a lot of things you want to get done around the house, maybe you have studying to catch up on, maybe it's terrible weather outside and you just don't feel like going out--or maybe it's a beautiful sunny day and you'd rather spend it enjoying the outdoors. There is no shortage of reasons that we have for wanting or thinking we need to miss church. But when we feel like we want to skip that Sunday, that may just be when we most need to go; that is likely when we most need to hear God's Word, to worship with His people, and to have fellowship with other believers. Here are some reasons why going to church is so vital, even--and perhaps especially--on days you don't feel like it. If you were raised in the church or have been a Christian for some time, this probably sounds almost cliche to you, but it's no less true. A church is the believers who attend it. It doesn't matter if you meet in a beautiful cathedral or a elementary school gym (I've attended churches that met in each and they were both healthy, edifying bodies of Christ), it is the coming together of believers for the shared goal of worshipping God and learning more about Him that matters. As I wrote in a previous Crosswalk.com article, "Many times in the New Testament, God’s Word speaks of the Church in plural terms (e.g. the 'Body of Christ'). It is meant to be a fellowship, a community, a group of people from all walks of life who have one major thing in common--salvation through Jesus." This is why online sermons or church services can be helpful and useful, but will never be able to replace a physical body of believers. 2. Church is not about you. When we think of our reasons for skipping out on church, they likely revolve around us: our families, our schedules, our life. What we likely are not considering is that if we miss church, we may be missing an opportunity to minister to someone there. If you're like me, perhaps you fall into the trap of thinking you are still the newer person, the one who is still learning about how the church functions and the names of all the members. But God reminded me recently that it doesn't matter if someone else has been attending longer or is on a ministry team--I can still reach out to people and minister to them. There is likely always someone at church who needs a word of encouragement, a hug, a listening ear, to be prayed for. Yes, some other church member can and perhaps will fulfill this need, but what if God is calling you to do it? 3. Church renews our hearts and minds. Something I often remind myself when I don't feel like going to church is that I never once went to church and regretted it. This is because once I'm sitting in the pew worshipping with other believers and hearing God's Word preached, my heart is refocused on God and my mind is renewed. The time of reflection and stillness that goes with confession, the biblically-based lyrics of the worship songs and hymns, and the sharing of the Lord's Supper all function as gifts God gives to His people in the midst of life's hectic busyness and stress. Although I mentioned that church is not about you in order to stress a focus on serving others, it is also true that God desires for His people to meet together every week because He knows we will need the refuge in life's storms which church can provide. 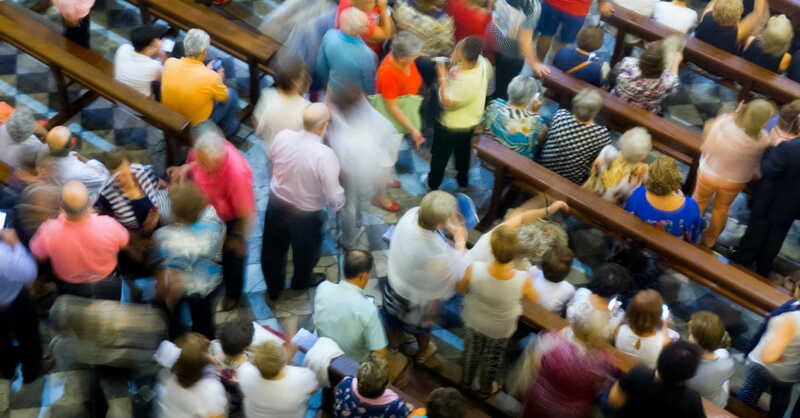 As David "Gunner" Gunderson writes for The Gospel Coalition in his article "The Most Important Time to Go to Church": "We gather because the God we’re worshiping has instituted our gathering as a main way he matures and strengthens and comforts us." 4. Church is a place for us to grow. Church is a place for us to grow in our faith, which can happen through hearing God's Word preached or by meditating on a passage of Scripture or singing a worship song. But church is also a place for us to grow as people period. One way that I have observed this happening is when serving in church begins to stretch you and bring you outside your comfort zone. When I've previously served in church, it's mostly been behind the scenes: setting things up, cleaning, holding babies. I'm not the person who is leading the worship team, reading the week's Scripture passage, or teaching children's church. Recently, however, a leadership opportunity practically fell into my lap. This opportunity takes me outside my comfort zone, but also reminds me that God is using the church to grow and challenge me, and hopefully is using me to bless others in that process. Author and pastor Trevin Wax summed up the core purpose of the church in a poignant way: “We do not go to church because of guilt. We are the church because of grace." I pray you are encouraged by that reminder this week, and that even when you don't feel like going, you will go and just be present with other believers and be open to how God can use you to bless them. NEXT: Are There Different Types of Praise in the Bible?